A very preliminary design proposal. A pre-sketch design. The vision of the architect. That was the type of language used yesterday at the media presentation to describe the winning design by Benthem Crouwel Architecten for the Stedelijk Museum in Amsterdam. Architectuurstudio Herman Hertzberger views the new wing as a largely free-standing volume connected to the existing building at the midway point of the central zone. The design contains no fewer than four public entrances: the old entrance is maintained, and the museum can be entered from Sandbergplein, Van Baerlestraat and Museumplein. A stairway next to the 'earflap' on the side of the Van Gogh Museum leads up to the terrace of the museum café. Located in the basement of the new wing, and clearly visible from Van Baerlestraat, is the nine-metre-high main hall. The jury: 'Hertzberger's daylight museum is a good, controlled building that has a recognisable predecessor in the recently opened Museum/CODA in Apeldoorn, by the same architect.' The connection to the 'earflap' is considered 'rather forced'. The assignment set last June for five offices (Architectuurstudio Herman Hertzberger, Claus en Kaan, Diederen Dirrix Van Wylick, Henket & partners, Benthem Crouwel) contained not only a programme of requirements but also a preamble. In it we read that the Stedelijk Museum aims to re-establish its position as the 'confident centre of cultural life'. The new museum must form one entity, but each of the two parts (the old building from 1895 and the new wing) should have a character of its own. Unity in duality. 'Arranging to meet in the Stedelijk Museum should become an obvious choice once again. For readers to young to remember, in the 1960s the Stedelijk was what we now like to call a 'cultural hotspot'. People went to the museum not only to look at art but to see one another and be seen. In the preamble, Museumplein, and in particular the so-called 'earflap', is referred to as problematic. 'It must be possible to set right in aesthetically acceptable fashion the landscaping, which pays no heed to the museum at the moment.' The jury, which included Wim Quist, Hans Beers, Maarten Kloos and Sjoerd Soeters, deployed five criteria in assessing the schemes. Did the designs contain the required number of square metres? Was the budget limit respected? As changes to the zoning plans would require more time and money, to what extent did the schemes respect the zoning plan? How did the schemes resolve the fact that the building doesn't have a rear? 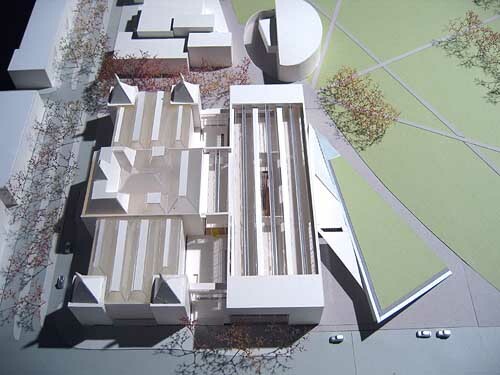 And finally, since the new wing will be the last volume facing Museumplein, where is the entrance located? The jury needed just a few hours of deliberations before reaching a unanimous verdict: the design by Benthem Crouwel stood head and shoulders above the rest. The board has embraced the jury decision, and the recently appointed museum director Gijl van Tuyl is also enthusiastic. The latter is so much to the good, since the previous museum director, upon his appointment, torpedoed Venturi's design. And we all know what happened after that. Rijkman Groenink, chairman of the board, lauded the design by Benthem Crouwel as a 'state-of-the-art museum in the world'. 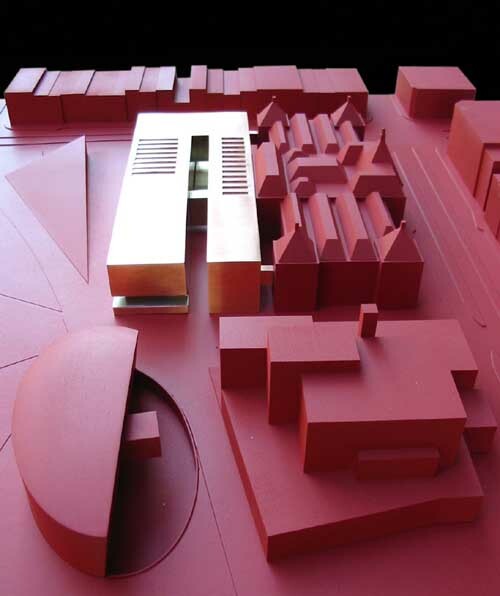 What sets the winning design apart from the other four schemes was the location of the main entrance on Museumplein. 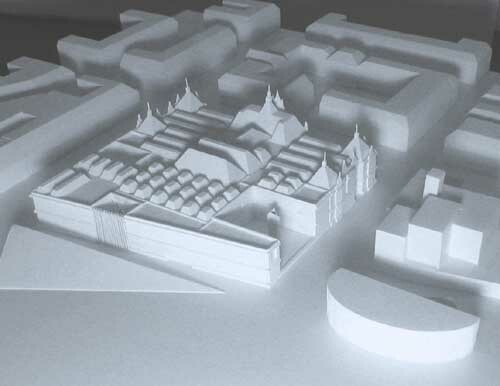 A huge new forty-metre-wide roof at the height of the existing roof extends the full length of the existing building. The space under the roof is enclosed by glass. The foyer thus formed contains the new museum entrance. Planned in front of the foyer is a square, or piazza as the jury report calls it. From the foyer visitors can enter the existing building, the layout of which is maintained, or descend to the main gallery and a number of smaller galleries. Daylight enters these underground spaces through voids and light shafts. Also located underground are workshops and studios. The foyer also offers access to a suspended volume 'hanging from the roof'. 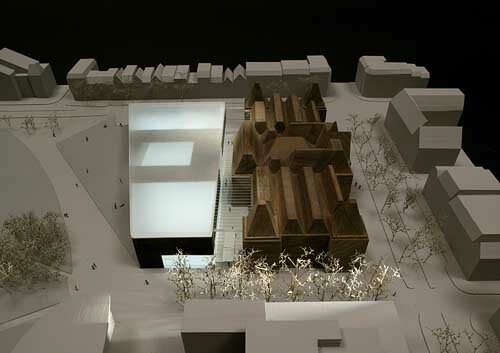 Contained inside are, amongst others, a medium-size gallery and auditorium. The floor above contains office space. But before building can start, a few design problems still need to be resolved. Much will depend on the final form, details, and materials of the suspended volume. Free forms of this sort run the risk of looking banal and cheap. Preserving the open character of the ground level will not be easy either. The success of the design will depend on how the support structure is detailed. The columns in the presentation drawings look like they are made of glass or are absent altogether. A sturdier though equally 'absent' solution will have to be found to achieve the desired degree of transparency. 'Visitors can reach the exhibition areas and other zones along routes of their own choosing,' the explanatory text tells us. That reads well, but it might just as easily be confusing and simply a cleverly worded way to disguise an unresolved design issue. Wandering through a museum can be fun, but sometimes you just want to be routed through the galleries as quickly and efficiently as possible. Relocating the entrance turns the existing monumental stairway – spatially the distinguishing feature of the current Stedelijk – into something of a problem. Claus en Kaan was the only office that dared take the ultimate step: they proposed demolishing the stairway and building a new, equally monumental stairway that travels in the opposite direction. Benthem Crouwel solves the issue with an escalator in the opposite direction, but the question is whether that will be enough to give the current stairway a self-evident position. No insurmountable difficulties, provided the architects have the time and attention to resolve them and adjust the sketch design where needed. Herman van Vliet, who spoke on behalf of the client, said he expects the definitive design to be completed in one year, after which time construction, expected to take two years, can start. Let's hope that client and architect can muster up enough composure and don't rush through the design. Starting on September 9 the five designs are on show at the Stedelijk Museum CS. See the Stedelijk Museum website. Benthem Crouwel (http://www.benthemcrouwel.nl/), Claus en Kaan architect (http://www.clausenkaan.nl/), Diederen Dirrix Van Wylick architect (http://www.ddvw.nl/), Henket & Partners architect (http://www.henket.nl/) and Architectuurstudio Herman Hertzberger(www.hertzberger.nl).